CINCINNATI -- Jurors will hear closing arguments in the Shayna Hubers retrial Tuesday morning after different experts have shared vastly different opinions of Shayna Hubers' mental health. 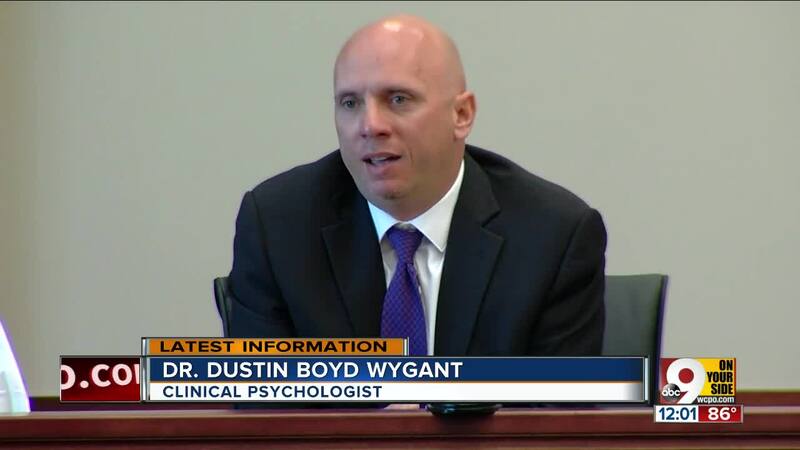 Dr. Dustin Boyd Wygant, a rebuttal witness for the prosecution, disagreed with the defense psychologist’s diagnosis of PTSD when he testified in Hubers’ murder retrial Monday. He said that while Hubers has a borderline personality disorder, she does not have post-traumatic stress disorder. Hubers confessed to fatally shooting her boyfriend Ryan Poston in his Highland Heights condominium in 2012. A judge sentenced her to 40 years in her first trial, but that was overturned because a juror didn’t disclose a felony conviction. Wygant interviewed Hubers for 15 hours in May and concluded she knew what she was doing during the 911 call and her videotaped statement to police. He said he didn't believe Hubers showed any dissociation. "She was able to recall how she felt during the shooting and shortly thereafter," Wygant said. "She was able to provide some connection to what Mr. Poston might have been feeling, that he was suffering and she would end his life because of that." On cross-examination, defense attorney David Eldridge tried to refute that claim. She asked about Hubers referring to herself in the third-person during the police interview. The defense rested Friday after calling just four witnesses -- including Hubers herself -- and psychologist Dr. Thomas Schacht. 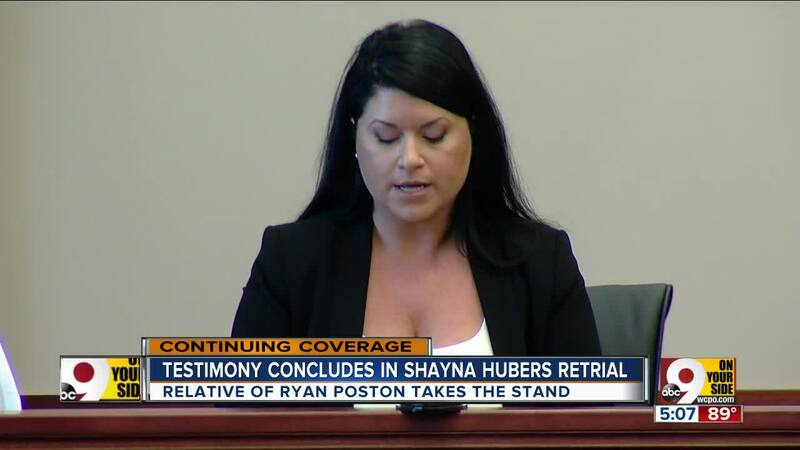 Hubers’ psychological condition was “seriously abnormal” when she shot Poston, Schacht said. Schacht said she has borderline personality and complex PTSD as well as substance abuse and sexual dysfunction. The defense has claimed self-protection from the start, saying Poston was an abusive boyfriend who physically assaulted Hubers before she shot him six times. Commonwealth attorneys dismiss those claims. They believe Hubers murdered Poston because he wanted to end their relationship. They said her statements indicated she knew what was going on. Carissa Carlisle was technically Poston's step-cousin, but they called each other cousin. She also happened to attend the University of Kentucky with Hubers and lived in the same apartment complex as her. Carlisle tried to get Hubers to see her time with Poston was over. She said Hubers wanted to continue the relationship. Carlisle testified that she received text messages from Hubers joking about having a key to Poston's condominium. "She specifically said, 'I'm at his house in Northern Kentucky. Ha ha. I've had a key for over a year now. He never asked for it back, even when we broke up. LOL,'" Carlisle recalled. Poston eventually wanted to move on from Hubers. He asked his cousin to help explain it to her. "I would try and tell her why the relationship was ending and give her benefits of that," Carlisle said. "I was trying to convince her it was OK that the relationship was ending. She never really listened to me, though." Carlisle said Hubers would often take her phone from her apartment without her knowledge to communicate with Poston. She told Hubers to stop, but Hubers wouldn't. Another incident ended the friendship between Carlisle and Hubers. "She read my conversation between Ryan and I, and afterwards he texted me and said she saw the conversation and that wasn't supposed to happen and that he never meant to hurt her," Carlisle said. Highland Heights Police Chief Bill Birkenhauer was called back as a rebuttal witness and asked to examine the bra Hubers was wearing the night of Poston's shooting. The bra is important because Hubers has claimed Poston picked her up by the bra and pants and threw her 12 feet into a sofa. If that happened, the bra would be damaged. But Birkenhauer testified that none of the clips were broken and the garment wasn't stretched, ripped or torn. The prosecution called a total of five rebuttal witnesses. The commonwealth and defense both rested their cases. Closing arguments will begin Tuesday morning. If jurors determine Hubers is guilty, they’ll move right into a sentencing hearing and make a recommendation to Judge Daniel Zalla.